The city is home to five national historic districts: the Downtown Johnstown Historic District, Cambria City Historic District, Minersville Historic District, Moxham Historic District, and Old Conemaugh Borough Historic District. Individual listings on the National Register of Historic Places are the Grand Army of the Republic Hall, Cambria Iron Company, Cambria Public Library Building, Bridge in Johnstown City, Nathan's Department Store, and Johnstown Inclined Railway. Archaeological evidence shows that the area was inhabited for some 10,000 years. Penn's Woods saw much Native American activity as well as the Quemahoming area. Three distinct tribes (Shawnee, Delaware and Monogahela) migrated, hunted and fished in the area. 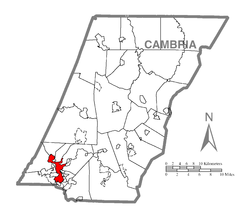 Johnstown was called Conemaugh Old Town in the native Algonquin language. Old Town was linked to the outlying areas by the Stoney Creek, Quemahoming Creek and Conemuagh Rivers joining Johnstown to older settlements on the river including New Florence (Squirrel Hill), Quemahoming and Kickenapaulin's (near Hooversville). The Johnstown flood of 1889 established the American Red Cross as the pre-eminent emergency relief organization in the United States. Founder Clara Barton, then 67, came to Johnstown with 50 doctors and nurses and set up tent hospitals as well as temporary "hotels" for the homeless, and stayed on for five months to coordinate relief efforts. In 2003, U.S. Census data showed that Johnstown was the least likely city in the United States to attract newcomers; however, what were previously relatively weak opportunities provided by the local manufacturing and service economies have more recently begun to burgeon, attracting outsiders. Gamesa Corporación Tecnológica, a Spanish wind energy company, opened its first U.S. wind turbine blade manufacturing facility near here in 2006. Several wind turbines are sited on Babcock Ridge, the "Eastern Continental Divide", along the eastern edge of Cambria and Somerset counties. Lockheed Martin relocated a facility from Greenville, South Carolina, to Johnstown in 2008. Companies like Concurrent Technologies Corporation, DRS Laurel Technologies, ITSI Biosciences, Kongsberg Defense and more throughout the region are in business for themselves. Recent construction in the surrounding region, the downtown, and adjacent Kernville neighborhood—including a new 100,000-square-foot (9,300 m2) Regional Technology Complex that will house a division of Northrop Grumman, among other tenants—signal the increasing dependence of Johnstown's economy on the U.S. government's defense budget. The high-tech defense industry is now the main non-health-care staple of the Johnstown economy, with the region pulling in well over $100M annually in federal government contracts, punctuated by one of the premier defense trade shows in the U.S., the annual Showcase for Commerce. Johnstown remains a regional medical, educational, cultural, and communications center. As in many other locales, health care provides a significant percentage of the employment opportunities in the city. The region is located right in the middle of the "Health Belt", an area stretching from the Midwest to New England and down the East Coast that has had massive growth in the health care industry. Major health care centers include Memorial Medical Center and Windber Medical Center, the Laurel Highlands Neuro-Rehabilitation Center, and the John P. Murtha Neuroscience and Pain Institute, with its advances in treating wounded veterans, and the Joyce Murtha Breast Care Center’s focus on early diagnosis and advanced treatment. In 2019, Johnstown was named the poorest town in Pennsylvania. Johnstown is located in southwestern Cambria County at 40°19′31″N 78°55′15″W﻿ / ﻿40.32528°N 78.92083°W﻿ / 40.32528; -78.92083 (40.325174, -78.920954). As of the census of 2010, there were 20,978 people, 9,917 households, and 5,086 families residing in the city. The population density was 3,555.6 people per square mile (1,371.1/km²). There were 11,978 housing units at an average density of 2,030.2 per square mile (782.9/km²). The racial makeup of the city was 80.0% White, 14.6% African American, 0.2% Native American, 0.2% Asian, 0.02% Pacific Islander, 0.7% some other race, and 4.3% from two or more races. Hispanics or Latinos of any race were 3.1% of the population. In the three-year period ending in 2010, it was estimated that 22.3% of the population were of German, 15.8% Irish, 12.9% Italian, 7.7% Slovak, 6.7% English, 5.6% Polish, and 6.1% American ancestry. At the 2010 census there were 9,917 households, of which 22.0% had children under the age of 18 living with them, 28.5% were headed by married couples living together, 17.1% had a female householder with no husband present, and 48.7% were non-families. 43.0% of all households were made up of individuals, and 17.9% were someone living alone who was 65 years of age or older. The average household size was 2.08 and the average family size was 2.87. The age distribution was 21.7% under 18, 8.4% from 18 to 24, 24.4% from 25 to 44, 27.9% from 45 to 64, and 18.5% who were 65 or older. The median age was 41.8 years. For every 100 females, there were 87.9 males. For every 100 females age 18 and over, there were 84.5 males. For the period 2011–2013, the estimated median annual income for a household in the city was $23,785, and the median income for a family was $32,221. Male full-time workers had a median income of $31,026 versus $28,858 for females. The per capita income for the city was $15,511. 34.2% of the population and 26.9% of families were below the poverty line. Of the total population, 55.0% of those under the age of 18 and 18.4% of those 65 and older were living below the poverty line. The unemployment average is reported at 9%. Most of the jobs center around health care, defense, telemarketing and retail. The Bruce Springsteen song "The River" mentions the Johnstown Company: "I got a job working construction, for the Johnstown Company, but lately there ain't been much work, on account of the economy." "Highway Patrolman", another Springsteen song, has the lyrics "as the band played 'Night of the Johnstown Flood.'" Part of the film Rock Star takes place in Pittsburgh, and several scenes, including the opening scene, were filmed in Johnstown. Johnstown's television market is part of the Johnstown/Altoona/State College market. NBC affiliate WJAC-TV 6 and Fox affiliate WWCP-TV 8 are licensed in the city. Johnstown is also served by CBS affiliate WTAJ-TV 10 and ABC affiliate WATM-TV 23, both based in Altoona, and State College-based PBS member station WPSU-TV 3, licensed to Clearfield but based on the Pennsylvania State University campus. WPCW 19, The CW's owned-and-operated station in Pittsburgh licensed to Jeannette (and was itself once licensed in Johnstown), serves as the market's default CW affiliate. Several other low-power stations, including WHVL-LP 29 (MyNetworkTV) in State College, also transmit to Johnstown. Passenger rail service is provided by Amtrak's daily 'Pennsylvanian'. The city is located on the former mainline of the Pennsylvania Railroad. Norfolk Southern operates 60-80 trains daily on these rails. CSX also has a branch into the city. 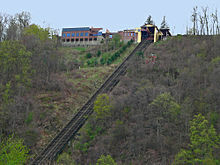 CamTran operates the local bus service and the Johnstown Inclined Plane. Until 1976, local transit service was operated by a private company, Johnstown Traction Company. Streetcars (or "trolleys") operated in Johnstown until 1960, and trolley buses from 1951 until 1967. Johnstown hosts a number of events that draw people to the town each year. One event being “Thunder in the Valley”. This event is a motorcycle rally that draws people from all over. The event has serval vendors that come and sell food and merchandise. There are several bands that perform during the rally as well. Another event is the AAABA amateur baseball tournament. It brings in the top teams in the AAABA league to compete in a tournament held at the Point Stadium. The Point Stadium is Located in downtown Johnstown. the summer of 2018 will be the 74th Annual tournament held in Johnstown. The Flood City Music Festival is an event that brings people to the town. It brings artists from all over the country to come and perform in the same place. The event is held at Peoples Natural Gas Park. That has two stages that the bands perform on are The Oil House and The Polacek Pavilion. The Sunnehanna Amateur golf tournament is held once a year at Sunnehanna Country Club. The tournament brings some of the best amateur golfers in the county to compete at this course they play a total of 72 holes of golf. Many professional golfers have golfed in this Tournament such as Tiger Woods, and Arnold Palmer. In the summer of 2018 this will be the 65th Annual tournament. The junior high wrestling state championships are held at the Cambria County War Memorial Arena. This event brings the top Junior High wrestling competitors from across the state of Pennsylvania to compete for the individual wrestling state championship. The Johnstown Fire Department is located at 401 Washington street Floor 2. The Fire Chief of the department is Anthony Kovacic. the Johnstown fire department has available response teams for Hazardous Materials and a boat in which they are able to perform water and ice rescues. Along with the fire department is Part of the SERT team (Special Emergency Response Team). The fire department provides Paramedics the provide quick medical services to people in the event of an emergency. the fire department also gives classes on fire safety to any one who would like to go the station and learn. The Johnstown City Hall is on 401 Main Street. The Mayor of Johnstown is Frank Janakovic, and the Deputy Mayor is Marie Mock. Frank Janakovic attended the Indiana University of Pennsylvania and the University of Pittsburgh at Johnstown. He acquired a minor in business/ accounting and a degree in Sociology. Janakovic was also a Co-Founder of ACRP (Alternative Community Resource Program). ARCP is an organization the help underprivileged families. Silver Drive-In – first opened in 1962. While other such facilities in the area have closed over the course of years, the Silver survived through public outcry over proposals to close and demolish it, making a comeback in 2005. Located in Richland Township, it is now the only drive-in theater in the Johnstown, Pennsylvania region. Jeschonek, Robert. (2013) Christmas at Glosser's. Pie Press Publishing. Morawska, Ewa. (2004) For Bread with Butter: The Life-Worlds of East Central Europeans in Johnstown, Pennsylvania, 1890-1940., Cambridge University Press. Morawska, Ewa. (1999). Insecure Prosperity. Princeton University Press.